Apprenticeships allow you to bring new talent through the ranks and train your team with the skills they need to help your business succeed. Thousands of businesses are already benefitting from apprenticeships. We’re here to make it happen for you too. Submit your details to get started. Our apprentices have been a huge asset to the company: they allow us to take control of our recruitment and grow our own talent. Apprentices have transformed our workplace culture with their enthusiasm, ideas and high levels of engagement. Almost two-thirds of our apprentices are still with the business a decade later. With the current skills gap, particularly in engineering, we passionately believe that apprenticeships are essential to encourage, develop and engage as our leaders of the future. As an SME, offering apprenticeships has been a key factor in our business growth. Our advisers will discuss the options you have and the next steps you need to take. Want to find out more about taking on an apprentice? Fill in our enquiry form with details about your business to request a call back later. Find out more about what grants and funding could be available as well as information about the pay and conditions of apprentices. What you need to know about apprenticeship reform and the Apprenticeship Levy. On the 6th April 2017, the Government will introduce the apprenticeship levy, with a view to creating millions of apprenticeships across the UK. The apprenticeship levy will be applied to all employers with an annual wage bill greater than £3 million however there will be a 0.5% tax on the total pay bill, which will be paid through Pay As You Earn. stop or pause payments (for example, if their apprentice stops their training, takes a break from training or the employer hasn’t received the service agreed with the provider). Through Estimate my apprenticeship funding, employers can calculate whether they will pay the levy or not, and what funds they will have to spend on apprenticeships. It also shows how much the government will contribute towards the cost of training. 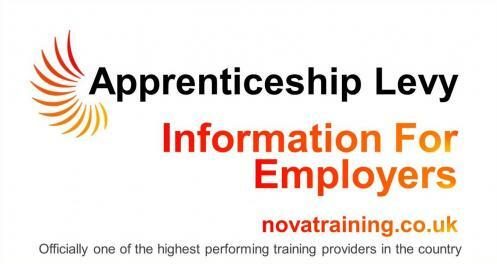 Find apprenticeship training gives employers easy-to-digest information on the choices available to them. Employers can search for and find an appropriate standard or framework, a quality-assured training provider, and compare one provider with another. Through Recruit an apprentice, training providers can post vacancies for apprenticeships and traineeships on behalf of employers. This will be opened up to employers at a later date. Whether it's an existing employee who needs re-training or upskilling or you have vacant post and are considering an Apprentice, we can help. Call our office now on 01902 716100 and speak to an apprenticeship adviser. If you have any questions regarding the levy which remain unanswered, please do not hesitate to contact us on 01902 716100 or email info@novatraining.co.uk and we will do our utmost to answer your queries.